How soon should we start lessons? We recommend to start at least 3 months before your big day. This will depend on the difficulty of the routine you want and your time availibility however. When can we have lessons? Lessons are available during weekdays and weekends in the morning, afternoon and evenings. 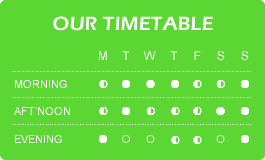 Our timetable (to the right) gives an indication of the availibility of certain times during a normal week. We will always endeavour to find a time that is convenient for you. The number of lessons you have is entirely up to you but as a general rule, for a basic routine, you should be planning at least 5 lessons. Keep in mind things like the length of time until your wedding, the amount of time in which you have to practise, and on the complexity of the dance routine that you would like to learn. What should we bring/wear to our first lesson? Make sure you wear comfortable clothes that you can move easily in. Stretch pants, flared skirts etc. are ideal as your legs will be able to move freely. Shoes should be comfortable with some support. Avoid rubber soles as these grip the floor. As your wedding day approaches, it is a good idea to bring your wedding shoes in for a lesson so that you can get used to dancing in them. Don't forget to bring in your CD with the song, or songs, that you have chosen. Can we record the routine? Of course, it is a great way to practise at home, so we encourage you to bring your camera and record individual moves and/or the whole routine. In fact we highly recommend it, even if you don’t have much time to practise — watching the video can definitely help you to remember the routine. "We would recommend these lessons to any couple who want to have fun with their wedding dance - you will have a great wedding knowing that you're relaxed and prepared! Our wedding dance was a huge hit and we have very happy memories. We really impressed some of our friends too..."
Parents of the Bride & Groom as well as the entire Bridal Party can also be catered for in your dance routine.